CVE Shop supply all types of Gas Interlock Systems. We also offer a vent fabrication service and are able to supply grilles to your exact requirements. Next Day Delivery available. Swimming Pool Vents and Linear Bar Grilles a speciality. Gas Solenoid Valve - Please contact us directly on 0161 336 5065 for bespoke products not listed as we specialise in made-to-measure vents and custom designs. A full range of screwed gas solenoid valves are available from stock. They range from ½ inch to 2 inch (For larger sizes please enquire). CVE Shop only supplies the highest quality gas solenoid valves to ensure maximum reliability and peace of mind. Valves up to and including 4 inch are generally the slam shut type. Valves above this size tend to be powerseat type. Information on flow rates and pressure drops are available on request. Can be used with all Merlin panels. 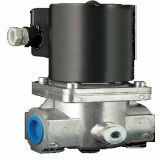 The standard valve is 240 volt normally closed but other types are available on request.
! A Gas Safe installer would be required to fit the gas solenoid valve. Check the register at www.gassaferegister.co.uk. All Merlin Range Gas Safety Products are delivered free of charge to mainland UK postcodes. Order now for free delivery next day before 4pm!